The entrance of the bar is located unimposing in a side alley of the Kärntner Strasse. The interior is very tasteful furnished with comfortable seats at dark leather settees, some bar tables and stools and a classical bar made of wood. The illuminated bottles at the wall behind the bar are especially looking well in the dim light. Apart from the big separated smokers area are you can find also a non smoker room. At classical hits from Dean Martin & Co. or lounge music you can enjoy the magnificent cocktails at moderate prices for the city center. In the summer you can also have your drink outside at a small terrace. And there is also a Happy Hour before 20:00 o'clock where you get most of the cocktails at a reduced pricing. At this time it is no problem to get a seat. At weekends after 22:00 o'clock this will be not so easy. The special atmosphere is also well known at the prominence. You can find some pictures of the most known visitors in front of the restroom entrance. This noble cocktail bar is located in the top floor of the well known department store Steffl at the Kärntner Strasse. The best way to come to this bar is by the transparent panoramic elevator where you get a foretaste at the fantastic view from the bar terrace. There you can enjoy the view above the rooftops of the city and discover also some of the sights of Vienna. 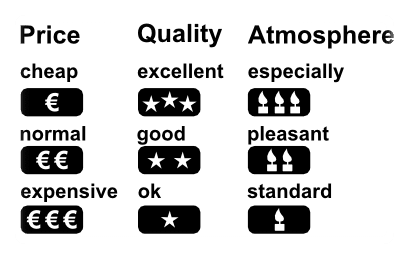 For the good quality of the cocktails, the noble flair and the beautiful view you have to pay an accordingly price for the drinks. But at an idyllic place on the terrace or during sitting inside on one of the comfortable leather settees you should be able to forget this drop of bitterness quite quickly. Usually you have a nice and pleasant bar music in the background and from Monday to Saturday there is also some live music.This exceptional atmosphere attracts additional to the wealthy guests also a lot of tourists and due to that there is normally a quite mixed and pleasant audience. 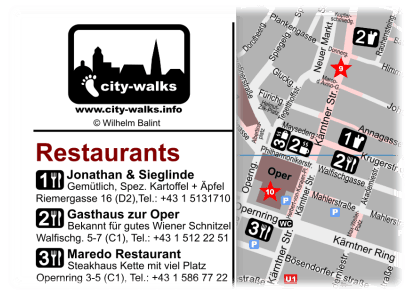 The Onyx Bar is located in the Haas Haus which is directly across the church Stephansdom. 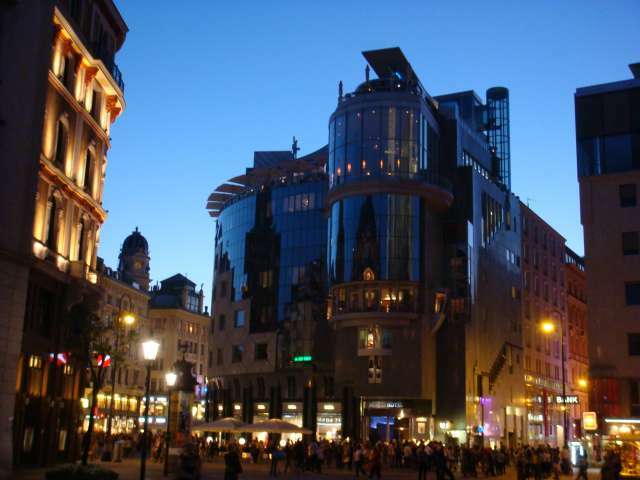 Here you can enjoy your cocktails behind a huge panoramic glass facade and at the same time you have a fantastic view at the Stephansdom and the surrounding streets and places. The noble flair is emphasized by the fine furnishing and the decent lounge music. Correspondingly the guests are usually dressed casually elegant at this location. Of course you have to consider an accordingly pricing for the high-quality cocktails at such a place. In case of a high visitor frequency you have to calculate some more time until you get served. A table reservation is only possible for guest of the Do & Co hotel which is located in the same building. This relaxing bar is centrally located nearby the place Hoher Markt. It is casually furnished with a lot of rattan sofas and seat arrangements around low coffee tables and some round bar tables and stools. There is a non smoking area as well as a smoker's room. Additional to a wide offer of different cocktails you can also choose among different warm dishes and snacks. During the Happy Hour from 18:00 to 20:00 o'clock you get some cocktails at a special pricing. The guest structure is fairly mixed and the average age is below 30. Especially at the weekend it can be quite crowded and difficult to get a seat. The Dinos is a classic among the bars in and around the old town of Vienna. Outside it does not look very inviting, but as soon as you enter the typical atmosphere should convince you. The name of the bar is of course also the motto of the music they are playing. At dim light conditions you can choose among a very wide range of cocktails, which are also served quite fast even if it is crowded. The good taste of the drinks is proven by the big number of guests during the weekend. If you do not come early enough it could be really difficult to find some place. The audience is diversified and the service is throughout friendly. Also in this bar you can find the typically bar ambience. Close to the church Stephansdom you can enjoy your drinks on two floors. Usually it is a bit more quiet on the upper floor. In the menu for the drinks you find besides a wide range of cocktails also a broad offer of different Whiskey types. The experienced team serves high-quality cocktails which you can enjoy at a pleasant mix of soul, jazz and blues music. During the Happy Hour between 17:00 and 20:00 o'clock you get most of the drinks at a reduced pricing. There is also a small terrace at the corner to the Kumpfgasse which can be used during the summer times until 24:00 o'clock. This is not a cocktail bar, but if you are looking for a disco in the center of the city and you do not have a problem with a bit alpine hut flair, then you are at the right place here. After the entrance in the ground floor you are in the restaurant area. From there steps are leading downstairs to the wardrobe where also the disco area is beginning. There are different rooms which are connected by corridors. The audience, which is mixed in age, has some fun at apres ski influenced music. At the weekend after 23:00 o'clock it can get very crowded. As you normally do not have to pay an entrance fee you can risk a glance by yourself.